Celebrate New Year with a whirlwind musical journey! 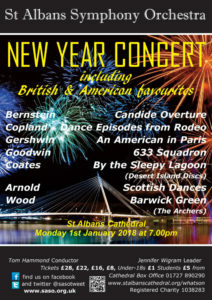 St Albans Symphony Orchestra (SASO) plan to celebrate Monday January 1st 2018 with whirlwind musical journey that travels via France, America and even the fictional village of Ambridge (7pm, St Albans Cathedral). The itinerary for New Year’s Day concert also takes in the Scottish Highlands, a well-known desert island and – closer to home – Heartwood Forest. What may sound like geographical chaos makes better sense explained as a programme combining classic American scores, with some of the best examples of British light music. Under its principal conductor, Tom Hammond, the orchestra will perform George Gershwin’s colourful travelogue An American in Paris. Sounds of the bustling French capital – including the composer’s requirement for four taxi horns – are mixed with more than a touch of Manhattan swing. America and France remain linked in Leonard Bernstein’s lively overture to his music theatre masterpiece Candide. But the Four Dances Episodes from Rodeo by Aaron Copland are taken from a ballet located entirely in cowboy country. The all-British second half of the concert matches music originally written for cinema – Ron Goodwin’s 633 Squadron – with scores made famous by radio. Eric Coates’ By the Sleepy Lagoon is otherwise known as the Desert Island Discs theme, while Arthur Wood’s Barwick Green is heard every week by millions of Archers fans. Malcolm Arnold’s wild and witty Scottish Dances will contrast with the urbane charm of Robert Farnon’s Westminster Waltz. The New Year audience also has the chance to enjoy a highlight from SASO’s 2017 children’s concerts: the Three Bears Phantasy by Coates accompanying an original story about a teddy bear called Watling, with decidedly local connections. 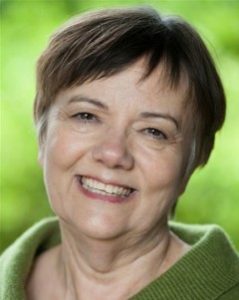 The orchestra is delighted to welcome actor Annette Holland, co-principal of children’s drama school Best Theatre Arts, as the narrator. For more information about the concert, including tickets, click here.